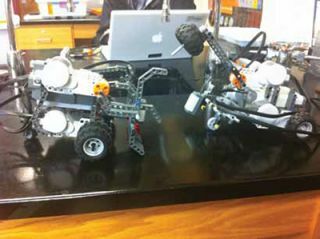 What they are doing with the grant: “We purchased 30 Lego Mindstorm NXT robotics kits with four supporting parts kits—not including software,” says Ted Emch, computer science teacher. “We flashed the NXT controllers with a Java virtual machine called LeJOS that’s available for free at lejos.sourceforge.net.” Emch’s goal was for his computer science classes to design and build robots they could control (or set to run autonomously) using standard Java, and it worked very well. “LeJOS provides classes for all of the components in the Lego kits and is much more powerful than the LegoNXT-G software normally used. The students were able to access the functions of the robots they built at a much lower level.” The unit culminated with a SumoBot competition in which the students constructed and programmed robots that would autonomously wrestle an opposing robot and push it out of the ring. How long it took to get the money: It took only a few months from the time the grant was submitted until the check arrived. The robots arrived a month later. What they are doing with the grant: Sixth-grade science students will use Vernier probes and LabQuest 2 interfaces in conjunction with underwater remotely operated vehicles (ROVs) they constructed in their engineering elective class. They’ll modify their ROVs to hold water-sample collection containers, use probes to monitor and analyze nitrate levels and conduct other water-quality tests at their adjacent wetlands. Next, they’ll compare their data with samples taken from a nitrate scientist’s collection site at a nearby lake. How long it took to get the money: Schneider received all of the probeware and equipment within weeks of winning the grant. What they are doing with the grant: Fourth-grade math teacher and TAP mentor Vanessa J. Powers used the money to buy 37 iPad Minis and three iPads. Powers’ students use the iPads for class work and assessments, including quizzes and exit tickets. “The iPads let me differentiate instruction,” says Powers, who loves that the apps allow students to work at the appropriate level and scale up when they’re ready. “One student even taught herself how to do powers, which is a 7th-grade skill,” she says. How long it took to get the money: Approximately two months. Tips for schools seeking grants: Powers says to articulate your need clearly. She did research on what she wanted to acquire and included quotes or statistics in her grant applications to justify why she believed it would work. “I have a plan to show how I’m going to use it and how I’ll evaluate it. If you don’t show how you’ll use it, you won’t get the money.” When Powers came to Central Park Elementary one year ago, the school’s test scores were the lowest in the parish. Since she’s arrived, she’s received $21,000 in grants and her students’ test scores had the highest percentage of increase in passing rate in the parish. What they are doing with the grant: Seventh-grade math teacher Matt McGuire wanted to engage his students with hands-on projects, so he’s using the grant money to help his students learn how to design and manufacture toys for needy children at a children’s hospital. By using digital fabrication—creating digital models with CAD, creating robotic instructions with CAM, and prototyping and producing them using a Computer Numerical Control (CNC) router system—students will engage in every aspect of manufacturing technology. How long it took to get the money: Two weeks after McGuire received notice that he won the grant, Toshiba delivered the check at a board of education meeting. Grant and amount awarded: STEMsmart initiative of Gulf Coast Community Foundation, $2.5 million awarded to date (three years into a five-year initiative) to support 15 schools. An additional $2.2 million has been leveraged from other sources as well. What they are doing with the grant: The funding from Gulf Coast Community Foundation is allowing 15 schools across two districts to transform how teachers teach and students learn STEM subjects. Students and teachers worked together to redesign the classroom into the Classroom of Tomorrow. Classrooms have been equipped with TI-Nspire calculators, interactive whiteboards, large HP touch screens, digital probes, and digital microscopes. Teachers have undergone extensive training and students are mastering STEM subjects, critical thinking, teamwork, and more. Why they think they won: Sarasota County Schools has a track record for successfully fulfilling grants from the Gulf Coast Community Foundation. This is a multi-year partnership, and the district’s willingness to participate in professional training, student competitions, after-school clubs, and summer camps has made it a partner rather than just a grant recipient. How long it took to get the money: Funds are disbursed annually during a five-year period. Any tips for schools seeking grants? Understand that funders need results. While their measurements might not be monetary, they are very concerned with return on investment in terms of impact. Be prepared to report on your activities and results. Often, they share those results with other grant makers to encourage additional investment or to replicate best practices in other communities. Ed Ponikvar has been helping schools secure competitive grants since 1998. He and his team helped to secure the $45 million Student Achieving Standards grant, which was made available to 500 urban and rural Pennsylvania districts and resulted in more than 156,000 hours of professional development. We asked Ponikvar for some additional tips. • Let leadership know you’re applying for a grant. Administrators don’t want to be surprised (“Oh! We have 1,600 iPads arriving next Tuesday? The network won’t support that…”). Seek the appropriate approvals ahead of time. • Set expectations and seek expert advice. You can save time and increase potential awards by seeking expert advice. Investigate why you aren’t getting results. • Establish the need against the measure. Discuss how you will sustain the effort and measure the results. If it’s a federal grant and you’re not writing about Common Core, that’s not a good idea. The grant readers want to understand how the money or tools will fundamentally change behavior. If it’s a worthy goal, it must effect change.